As a security company we would naturally argue that alarm bell boxes are functional but in all honesty we’ve never thought of them as decorative. Until now! 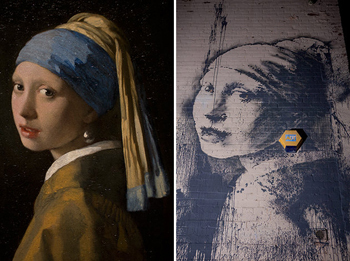 Infamous street artist Banksy has incorporated a bell box into his latest piece – a parody of the classic ‘Girl with the Pearl Earring’ by Vermeer. The bell box features as the earring and is entitled ‘Girl with the Pierced Eardrum’. See the story here. Ironically, the artwork in Banksy’s home town of Bristol was vandalised with black paint within 24 hours of the piece appearing. Perhaps a CCTV system would have complemented the burglar alarm as a more thorough security solution and deterred the vandals but then again, we’re sure the elusive artist would not want to risk being caught on camera! next Security engineers in the making?